Leading Fire, Safety and Security company Securefast have now added additional Mechanical Digital Locks designed to operate with the Traditional Style and Touch Bar range of Panic & Emergency Exit Hardware, as an alternative to the key operated Outside Access Devices. The Securefast Digital Locks offer keyless entry, have been mechanically tested with the Securefast Panic and Emergency Latches to EN1125 / 179:2008, fire rated for use on fire doors and salt spray tested to 240 hours, enabling them to be used on external doors. All the Digital Locks use the 'Easy Code Change' so that the code can be easily changed using a flat screwdriver on the back of the mechanism outside unit. Each of the Mechanical Digital Locks are supplied with an appropriate spindle to connect to the inside panic hardware device, have a non-sequential code and a neoprene seal for the outside unit. 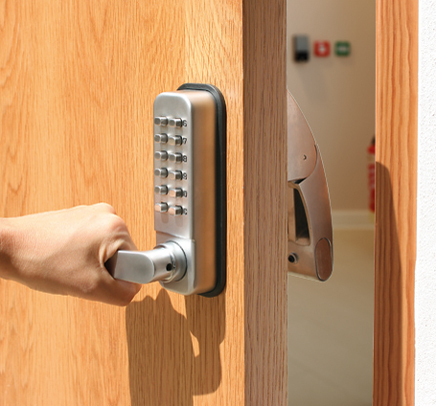 The range of digital locks available have a number of features and benefits including options with a Free Passage Mode, a stylist lever handle or knob on the outside unit and either 10, 11 or 13 digital combination buttons. I got such a good information on this topic its very interesting one. You made a good site and more example. I have found a similar website please check this one panic door hardware visit the site to know more about Safelocks.